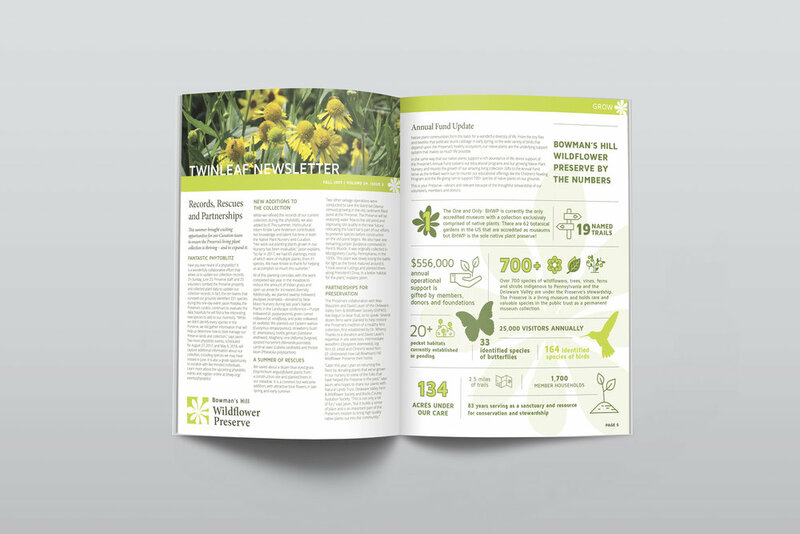 The Preserve approached McNabb Design in need of a full branding and website re-design, as well as a desire to increase overall online engagement. Their re-branding began with exploring data collected from both staff and Preserve members. While the data showed there was desire to give the logo a refreshed look, they also wanted to stay true to some meaningful elements of their original logo and appeal to their long-time audience base. The final result incorporated touches of a more modern, sans-serif typeface as well as a more graphic representation of the original trillium flower illustration. A new, vibrant accent color livened up the mark overall. When it came time to overhaul their website, the ability to accept funds online was high on the list of priorities. Several months were spent researching and developing a solution that would encompass their needs for online course registration, donations, and membership payments - a solution that would stay within budget too. The result was a multi-faceted, beautifully designed website that improved financial engagement with their constituents.